Hello! I'd love to enter my x-rays on the page with everyone else's. I imagine my x-rays are going to be a bit different from anyone else's. As you can see, I had a bit of a problem. 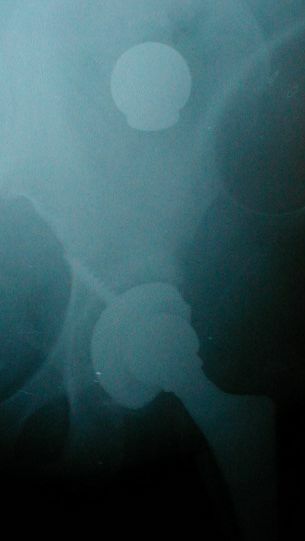 Shortly after the initial surgery, the hip dislocated. They tried to do a closed reduction, but that didn't work. So, they re-opened the surgical site in order to put everything back in place. 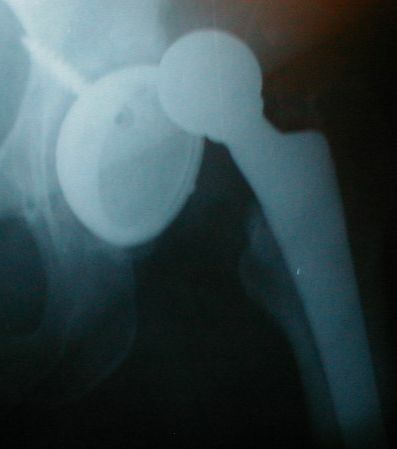 But, during that procedure, the femoral head of the implant popped off, and slid down into the body cavity. They were unable to get it, so it's still there.....hence my new nickname....Balls of Steel. 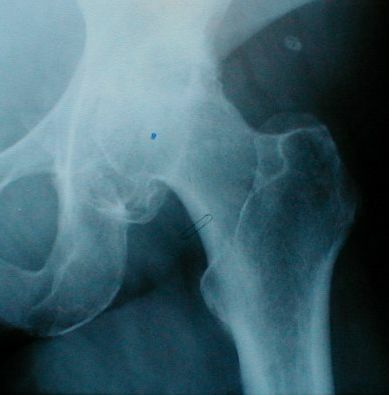 The first x-ray is "Before", with the hip joint being bone-on-bone. The second is the dislocation. I really enjoy your site. Thanks for putting it up. Before my surgery, and afterward, I've gone to it for information and a sense of community.